Without any doubt this is the most outstanding reason to travel to Somoto. The Canyon is spectacular and unique. There are several different options to enjoy the Canyon itself, you can simply walk to a lookout point up in the mountains and observe the geological formation, you can walk down to the river and then do some river hiking and swimming along the waterline, you can do some cliff climbing or rappel descents from the top to the bottom of the canyon… as you can see there are many different options! 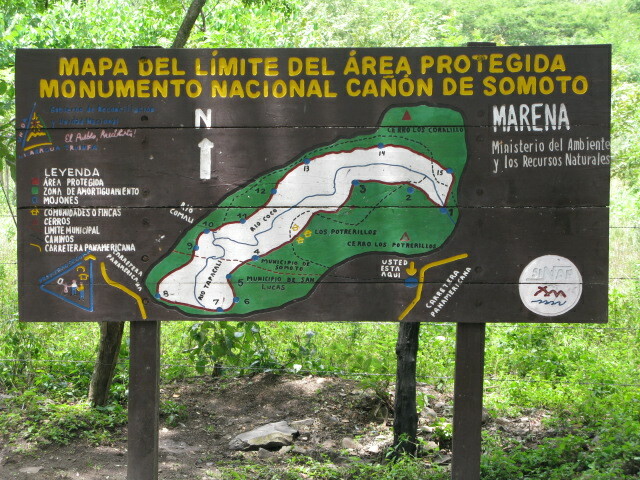 The detour to the Canon is clearly marked on the side of the road, about 7 kilometres from Somoto. If you are heading north towards the Honduran border you will see the detour on your right, obviously it will be on your left if you are coming south from the border! If you have a car, you can drive off the main highway into a dirt road for a short distance that will lead you to the visitor’s centre, where you must pay your entrance fee and park your car. Generally speaking, I thoroughly recommend that you hire a guide here, as the access to the canon can be tricky and it’s best to have someone with you who knows his way. If you spend the night in Somoto, you can hire the services of tour operator and a guide that will take you from there to the canyon. By far the best, most professional outfit is Namancambre Tours. The owner and chief guide, Gonzalo Hernandez is fluent with English and can offer you several alternatives for things to do in Somoto, which include rappelling down the walls of the canyon, mountain climbing up the walls of the canyon, and a river hiking / floating down the canyon. For more information, visit their page www.namancambretours.com or E-mail him at [email protected]. Do not attempt to do the cliff climbing or rappelling if you do not have the proper equipment! As far as I was able to investigate, only Namancambre Tours has the proper equipment for these activities! Although the narrow canyon is short, only about 3 kilometers, the tour can easily become one of your highlights to travelling in Central America. There is no other spot that is even comparable to this canyon in the entire region! There is no doubt that a visit to the Somoto Canyon is number one on the list of things to do in Somoto! 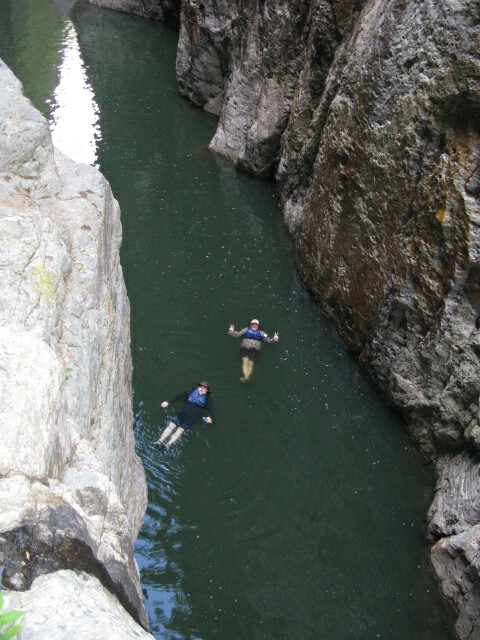 There are three different options for those that are interested in the river hiking, swimming in the canyon. The most common one is walking down the trail to the end of the canyon. From there taking a short paddle boat ride up the river. There you hire an inner tube to carry up with you as far as you can go, perhaps some 600 to 700 meters. Finally you float back down to the starting point. This option is the most popular and affordable. However do not neglect the fact that you are not given a life vest. Thus, your flotation will depend entirely on your ability to hold on to your inner tube! A second, much better option is to take the tour that starts at the beginning of the Canyon. Although this means more walking, you will be compensated by having the opportunity to enjoy the full length of the canyon, which is just over 2 Km. For this option you should hire a guide. 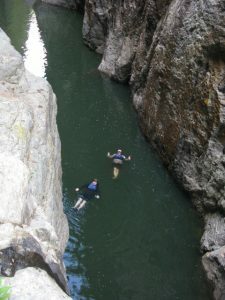 The guide should provide you with have a life vest on to protect you during your river hike/swim down the canyon. Gonzalo, from Namancambre Tours is unquestionably your best option! He has professional equipment to insure your safety. Life vests, security ropes, etc are always with him! He can also provide a mixed option, where you can rappel down the canyon rocks and then do the river hike. The rosquillas are ready! Taking them out of the oven! Number two on our list of things to do in Somoto is a visit to the “rosquilla” bakeries. Northern Nicaragua and eastern Honduras are famous for their “rosquillas”. These are made of corn flour and have the shape of a small donut, however they are crunchy. If you ask the locals, these are best while sipping a good cup of Nicaraguan grown coffee! Nicas love rosquillas! 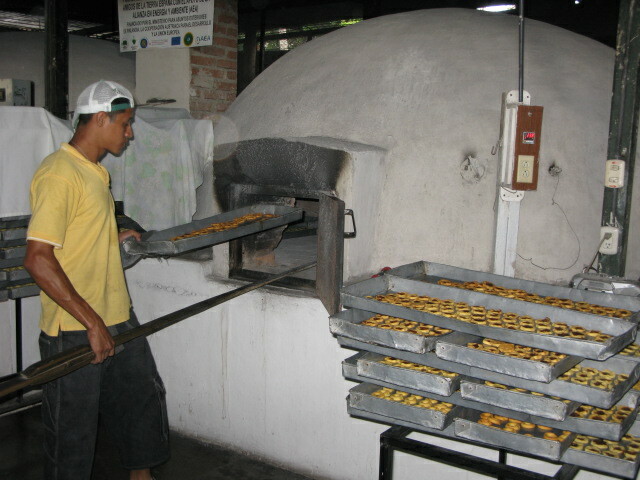 Rosquillas are made in different parts of Nicaragua and Honduras. However, there is a general consensus that the best of the best are those that are baked in Somoto. No real logical explanation for this; that is simply how it is! There are several rosquilla bakeries in Somoto. Ask around and the locals will direct you to their favourite rosquilla bakery. Many bakeries will allow you to enter the facilities to see the baking process. You will need to wear a hairnet and a mouth cover to comply with the local regulations. They will of course expect you to buy some rosquillas after your tour! There is no real tour per say, it is more of a self guided activity. If you speak Spanish you can ask the workers about the process and get an explanation of how the rosquillas come to be! Do not miss this tasty cultural experience, which is a unique to our list of things to do in Somoto!